The battle music in Wonderland, “To Our Surprise” is an incredibly upbeat and sprightly track, whose energy comes primarily from the punchy staccato notes in the main melody as well as the driving percussion: namely the cymbals, timpani, and snare drum, the last of which will be today’s article’s main focus. 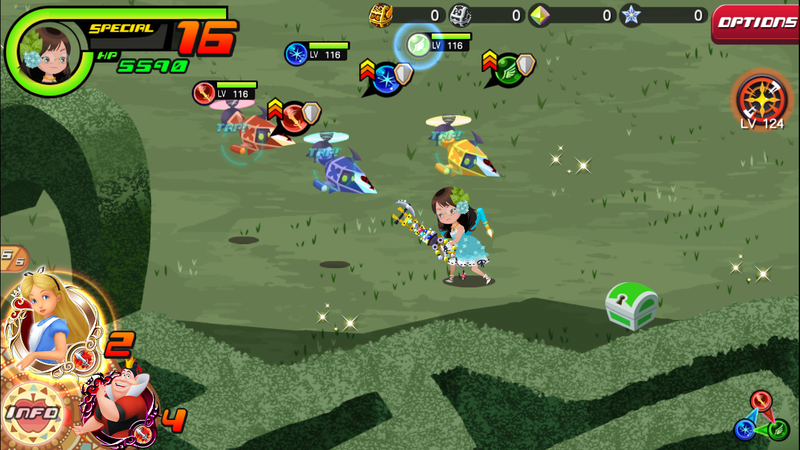 Let’s listen to “To Our Surprise”, which first was in Kingdom Hearts I, and is now used as the battle music in Wonderland in Kingdom Hearts Union Cross. The snare drum doesn’t come in until 00:08, but when it does, it plays fairly consistently all the way through until the end, stopping only at pivotal melodic sections. The snare drum is an interesting and unique instrument, especially in the sense that in a marching band, drum line, or other sort of ensemble that might include a snare drum, there is almost always just one. It has a very strong and piercing sound that can be heard above all the other instruments and therefore necessitates only a single one to be included in a group. What exactly is a snare drum? Well first let’s talk briefly about the anatomy of a drum—specifically, a tom-tom. A tom-tom drum is usually found in a drum set, or sometimes a bigger version as a floor drum in pit percussion. It has a head, originally made of skin but now usually made of plastic or other synthetic material, which is the part that is struck with the drum stick or mallet. The head is secured onto the body of the instrument, where the sound resonates most. And lastly, the tom-tom drum may or may not have an underside piece. Generally a player will have more control over the tuning and be able to produce an overall more resonant and crisper sound with a bottom piece, but I would not say it is absolutely necessary, as some tom-tom drums are made without it. The main difference between a tom-tom drum and a snare drum is the snares. Snares are tiny coils of metal which are organized very closely together and secured against the underside of the drum—the snare drum must have a bottom part against which the snares will vibrate.